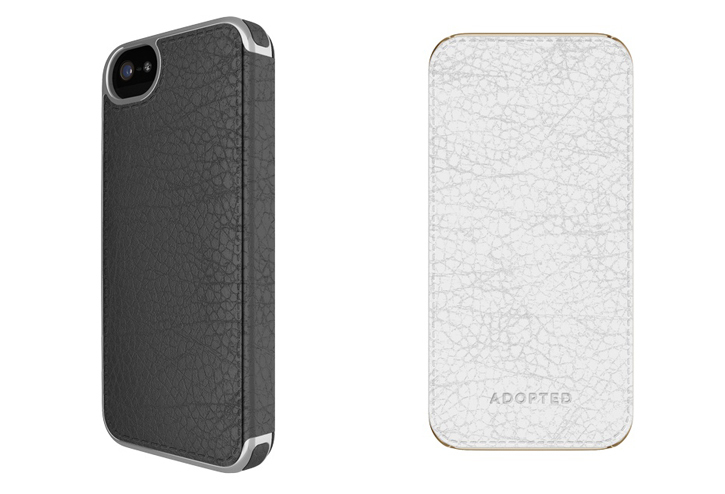 Adopted has introduced two classy full-grain leather folio cases for the iPhone 5 and iPhone 5S that feature complimenting gold and pewter silver metallic elements with chic aesthetics. Appealing to those who desire not only a more encompassing solution, but an integrated interior card pocket - Adopted's Leather Folio case is made using genuine full-grain leather on the exterior with a soft suede interior to protect the iPhone display. What ties the leather with the rest of the case is the Leather Folio's unique and patented "non-conductive metallized" frame which gives the case its stylish, luxury look. The Leather Folio features front, back, and side protection, easy snap-in installation, and full access to all buttons, ports as well as the Touch ID fingerprint sensor on the iPhone 5S. The Leather Folio is available in two color combinations: pewter leather with silver accents, and white leather with gold accents for $59.95. You can pre-order one today, and expect to get your hands on it in early October. The Leather Folio case will also be available at Apple retail stores around the world.